Next time you feel your dishes lack oomph, forget the salt shaker. Throw out the artificial flavoring packs and opt for the inimitable flavor of fresh herbs. Herbs can completely change the flavor of a dish. Add some herbs to chicken and it tastes Mediterranean, add some other herbs and it tastes of Asia, add something else entirely and the chicken seems to hail from the Caribbean. Herbs make all the difference. Herbs pack a massive flavor punch. But these aromatic herbs don’t just tickle the taste buds, guaranteeing a flavorsome meal; they also come with impressive health benefits. From fighting pain to protecting against chronic disease, herbs do it all. We give you the low-down on their health benefits, and how to store, use and cook with some of the most popular herbs out there. Refrigerate. Wrap the herbs with a small slightly damp paper or dish towel and keep in a plastic bag. Dry. 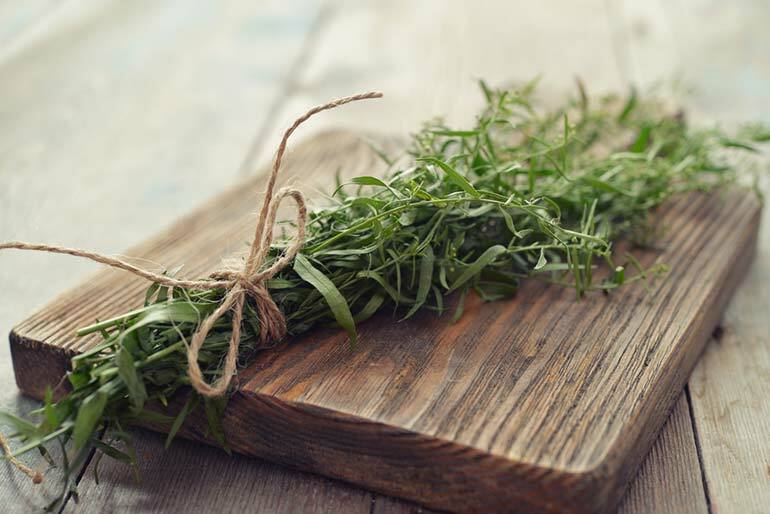 Simply hang herbs with low moisture content (like rosemary and thyme) upside down until they’re dry. Herbs such as oregano and basil need to be dried quickly to prevent molding – wash these herbs, pat dry and keep in a warm oven (about 180°F) for about 2 to 3 hours stirring them occasionally until they’re dried out. Store in water. This technique works great for herbs such as parsley, cilantro, oregano, sage, marjoram, basil, rosemary, tarragon, mint, and chives. Freeze. 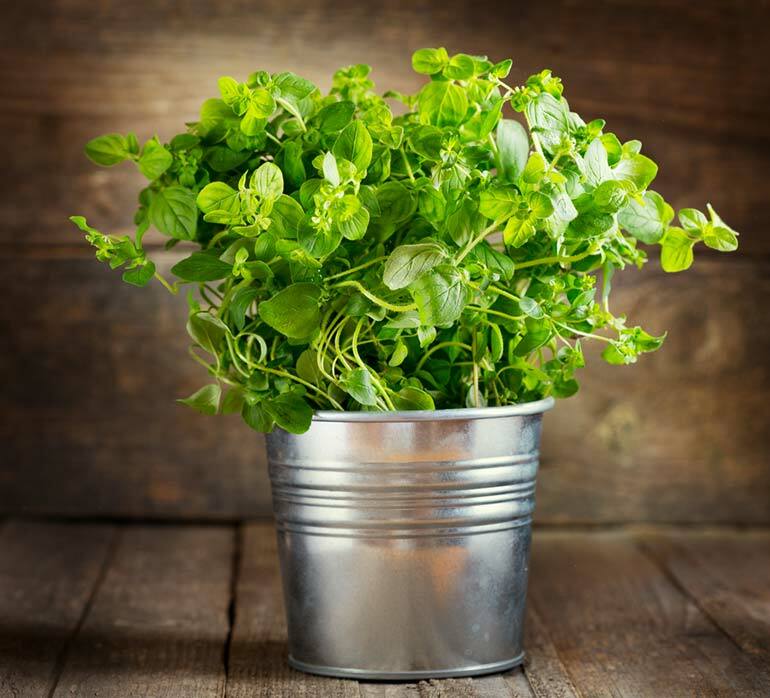 Start by rinsing the herbs under cold water; pat dry and allow the herbs to dry completely before transferring them to a freezer bag.‎ If you need to freeze herbs with softer leaves (like cilantro or basil), you may want to chop them after rinsing; keep in ice cube trays filled with water. Tip! If you’re freezing your herbs, make sure to label them as frozen herbs look a lot alike and won’t have their distinctive smell until they’re thawed. And why not grow your own herbs? Herbs like thyme, oregano, rosemary, mint, chives and lemon grass are quite easy to grow indoors. 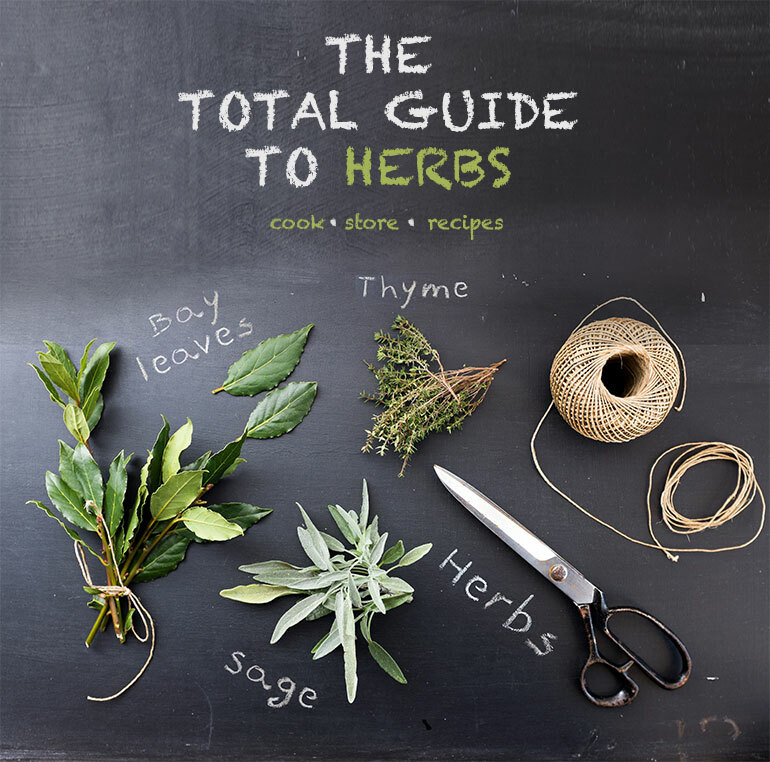 Below you’ll find a comprehensive guide to 12 popular herbs. For each herb we talk you through their health benefits, flavor, foods it pairs well with, dishes it’s particularly tasty in, how to buy the best fresh herb, and how best to prepare to get the maximum flavor and health benefits. 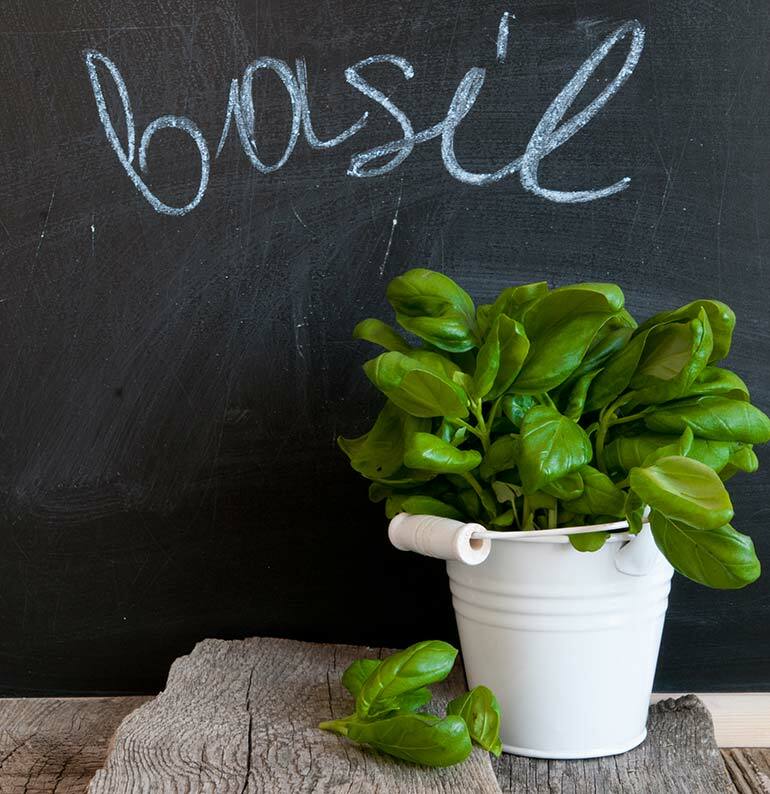 ‘Basil’ is derived from the Greek word for ‘royal’. And this little herb is totally living up to its name. According to research basil can protect DNA from free-radical induced damage – basil is rich in orientin and vicenin, two flavonoids that have been shown to reduce chromosomal damage 1 . Basil may also inhibit the growth of bad boys Staphylococcus aureus, Bacillus cereus and Escherichia coli – these antibacterial effects are thought to be down to the various essential oils present in the leaves 2 . Not only a protector of DNA and a fighter of bacteria, basil is also looking out for our joints. Studies suggest that basic may reduce arthritic pain. The essential oils found in basil are able to render cyclooxygenase (COX) less active. Inhibiting COX can provide relief from the symptoms of inflammation and reduce pain. 3 In fact, that’s how popular painkillers such as aspirin and ibuprofen work. Get the most out of this herb: If you have to buy dried basil, look for some organic ones and keep them for no more than six months. Pairs well with: Fresh basil pairs well with tomatoes, olive oil, vinegars, nuts, peppers, squash, eggplant, mushrooms and poultry. Prep like this: For maximum flavor cut into thin strips. An easy way to do this is to stack the basil leaves and roll tightly. Then cut the roll into thin strips with a knife or tear by hand. Get the most out of this herb: Use fresh, bright green bay leaves as far as possible since the dried form isn’t that effective. Great in: Long cooking draws out its aroma and so is great for braising and in stews, soups, stocks and risottos. Add a bay leaf to poaching liquid for fish or the milk for custard or rice pudding. Prep like this: You don’t need to pound or crush bay leaf before adding it to a dish, just add the whole leaf. But remove whole bay leaves from the dish before serving. Store like this: In a well sealed container. Dried bay leaves will last about two years before losing their aroma. 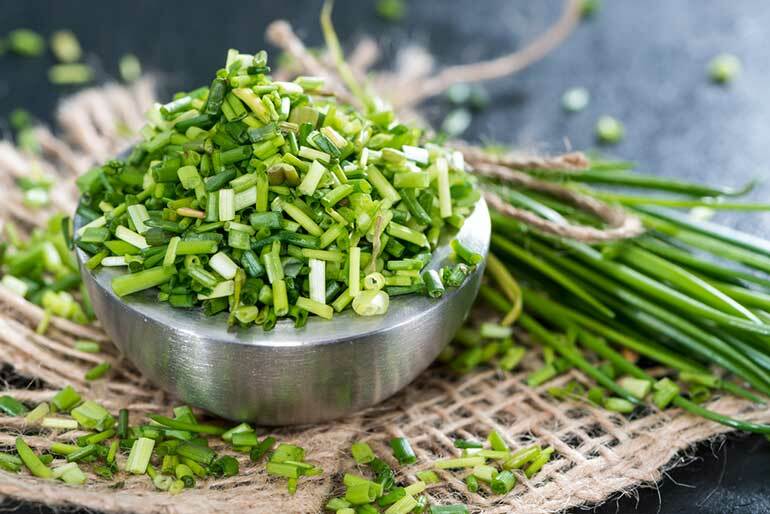 Get the most out of this herb: Chop the chives just before using – this will reduce loss of allicin which is volatile. Great in: Dips, quesadillas, omelettes, scrambled eggs and on baked potatoes . Use as garnish. Chop, then sprinkle over dips, fish, chicken and salads. Prep like this: Slice thinely to maximize taste. Best added at the end of cooking,as heat destroys their delicate onion flavor. Cilantro is also known as Chinese parsley or coriander leaves. It looks a lot like flat-leafed parsley, with which it’s often confused. But have a little sniff and you’ll immediately know the difference. Pairs well with: Avocado, chicken, fish, lamb, pork, shellfish, rice, lentils, peppers, tomatoes, and yogurt. Great in: Salsas, chutneys, guacamole, soups, stews, curries, and salads. Sprinkle leaves over spicy chicken and seafood dishes. How to store: To store cilantro, keep it attached to its roots – keep the roots in a little bit of water and the leaves loosely tented with plastic. 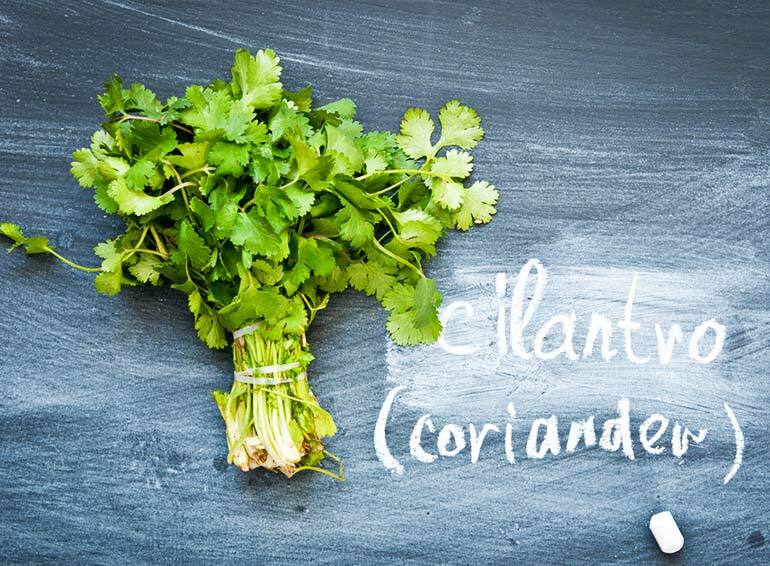 What’s the difference between cilantro and coriander? Cilantro and coriander come from the same plant, but their flavors are entirely different. You can’t substitute one for the other other. Coriander (aka coriander seed) are round seeds from the coriander plant. Coriander seeds are used whole or ground. Cilantro refers to the leaves of the plant and is also called “fresh coriander” or “coriander leaves”. Coriander seeds great in: Used in Middle Eastern, Mediterranean, Indian, Asian, Mexican, Latin American, and African dishes. Use in curries, curry powder, pickles, sausages, soups, stews, and ratatouille. Get the most out of this herb: Chop the leaves finely and sprinkle on your food just before eating. Pairs well with: Cottage cheese, cream cheese, goat cheese, omelets, fish (especially salmon), cucumber . Great in: Pickling, dressings, omelets, cold yogurt soups, potato salads. Prep like this: Add at the end of cooking, as its flavor is destroyed by heat. 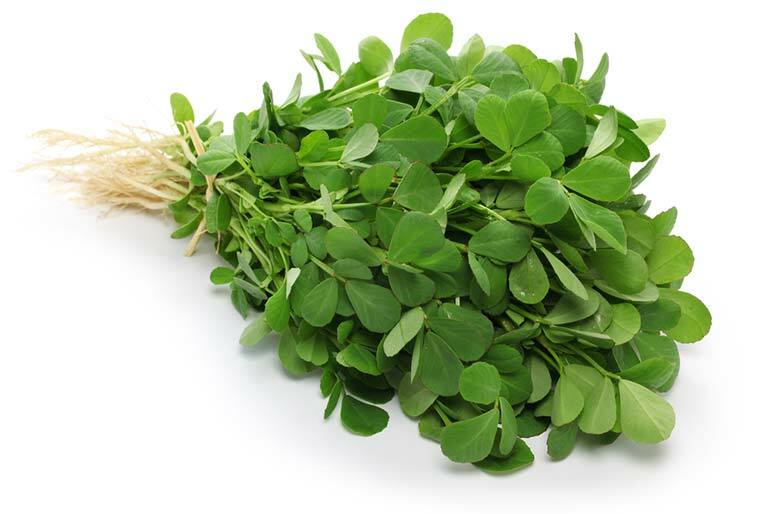 Widely used in traditional Indian medicine, fenugreek has an amazing repertoire of health benefits. Research has shown that this herb may improve sensitivity to insulin 13, rreduce cholesterol production by the liver 14, and boost liver health by making it more efficient at eliminating toxins from the body 15. Taste: Smells like maple syrup during cooking, but has a bitter, burnt sugar taste. Great in: Fresh leaves in curries (especially with potatoes) or fry-breads. Dried leaves added last-minute to sauces, curries, and soup. Store like this: Wrap the herb in a kitchen towel and refrigerate in a perforated bag. Oregano can do much more than simply liven up your pizzas and pastas – this little herb is packed with antioxidants that show promising health benefits. According to biologists from the UAE University, oregano has chemo protective properties, which means it can slow down or even inhibit the growth of cancer cells 16.What’s more, German scientists identified a compound in oregano (beta-caryophyllin), which can reduce inflammation and may be used as part of a therapeutic strategy in the treatment of atherosclerosis and osteoporosis 17. Pairs well with: artichokes, beans, eggplant, mushrooms, peppers, potatoes, tomatoes, zucchini, chicken, fish, and lamb. Great in: Mediterranean style cooking. Add to pasta, soups, stews, salads, pizza, tomato sauces, and vinaigrette. Store like this: If you plan to store oregano for more than 3 to 5 days, freeze it – gently and briefly wash the oregano, allow it to dry completely and freeze in a plastic bag for up to a year. There’s no need to thaw the herb before use. 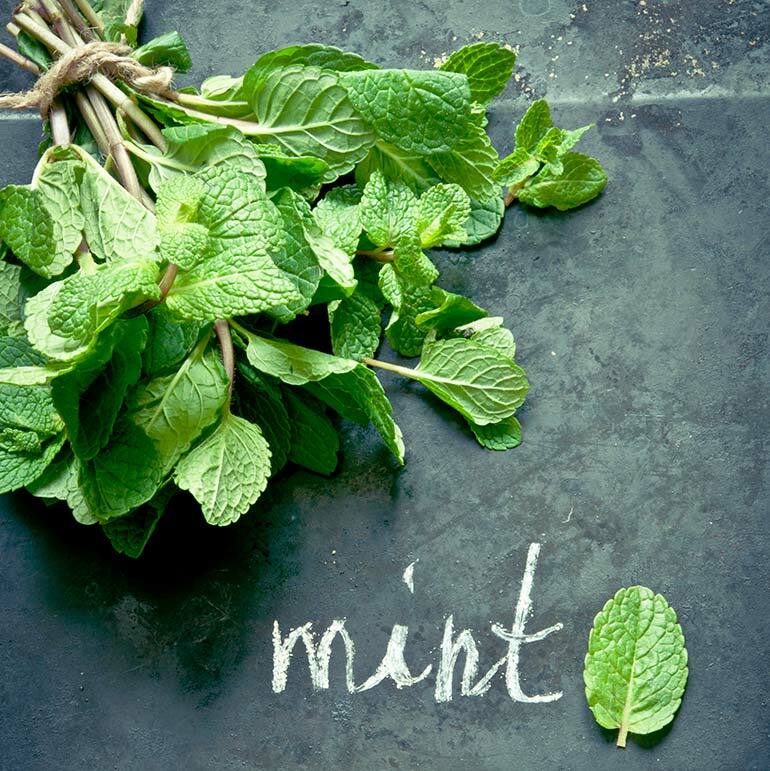 There are a whopping 30 types of mint out there, but the two most popular types are peppermint (bright green leaves, purple stems and peppery flavor) and spearmint (gray-green leaves and milder all round). Australian researchers reported that peppermint can offer some relief to individuals suffering from irritable bowel syndrome (IBS) 18. They explained that peppermint ‘activates an anti-pain channel’ in the colon which then reduces pain sensing fibers. This helps alleviate gastrointestinal pain associated with inflammation. Store like this: To store the fresh herb, trim its ends and keep in a glass container containing 1 inch of water. Change the water daily. Pairs well with: parmesan, chicken, pork, potatoes, and tomato. 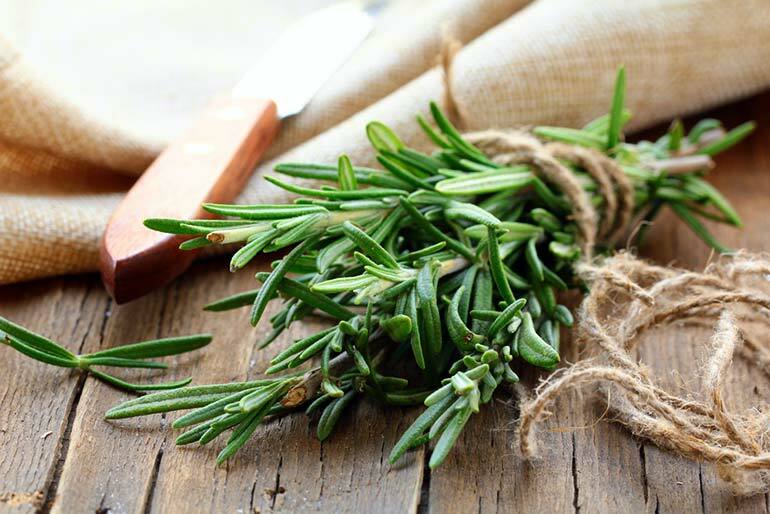 Store like this: Store dried rosemary leaves in an airtight container and keep in a cool, dry and dark place to conserve freshness and flavor. Known as the king of herbs by the French, tarragon has been used traditionally to sooth sore gums. According to current research, tarragon can also be used to calm a stress-induced stomach upset 21, improve digestion 21, and reduce free-radical damage 22. Tarragon also possesses antibacterial and antifungal properties 22. Pairs well with: Chicken, fish. Great in: Salads, stuffings, omelets, béarnaise sauce, french cooking. Get the most out of this herb: Add the herb at the end of cooking – exposing it to heat for too long brings out its bitter flavor and destroys several of its nutrients. This popular herb has been used in 16th-century England by those suffering from bronchitis. Research has shown that a component of thyme known as thymol, is indeed effective in the treatment of acute and chronic bronchitis. In one study, participants who were given a thyme supplement for 11 days reported a 16 percent reduction in coughing fits compared to the placebo group 23. Pairs well with: Most meats including pork, lamb, duck, and goose. Great for: All-purpose seasoning. 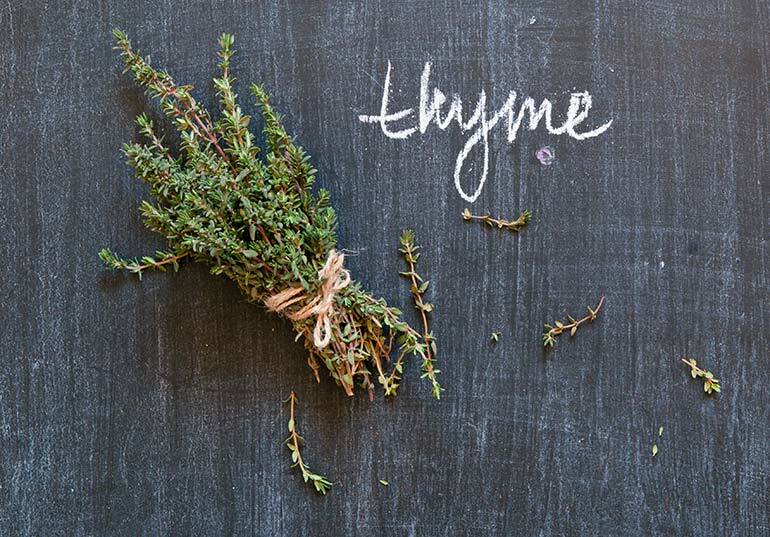 Thyme can withstand long cooking times is great in slow-cooked dishes such as stews. Also good in sauces, marinades, and stuffings. Prep like this: Doesn’t require chopping, as its leaves are tiny. Store like this: Wrap the twigs individually in a dry towel and refrigerate. Aga M, Iwaki K, Ueda Y, et al. (2001) Preventive effect of Coriandrum sativum (Chinese parsley) on localized lead deposition in ICR mice. J Ethnopharmacol. ; 77(2-3):203-8. Moghaddam AMD, Shayegh J, Mikaili P, Sharaf JD. (2011) Antimicrobial activity of essential oil extract of Ocimum basilicum L. leaves on a variety of pathogenic bacteria. J Med Plant Res. ; 5(15):3453-6. Khan, A., Zaman, G., & Anderson, R. A. (2009). 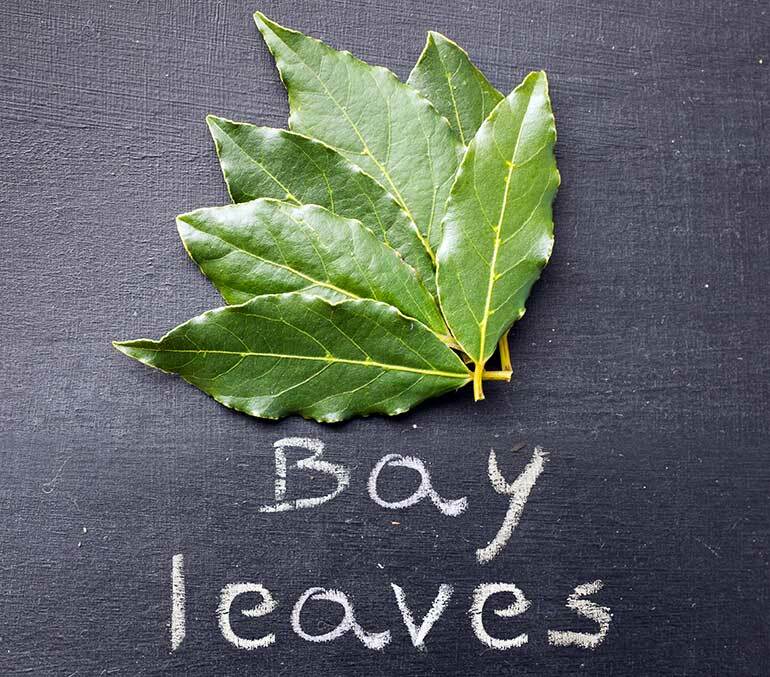 Bay leaves improve glucose and lipid profile of people with Type 2 diabetes. Journal of clinical biochemistry and nutrition, 44(1), 52. Fukuyama, N., Ino, C., Suzuki, Y., Kobayashi, N., Hamamoto, H., Sekimizu, K., & Orihara, Y. (2011). Antimicrobial sesquiterpenoids from Laurus nobilis L. Natural product research, 25(14), 1295-1303. Chan, J. Y. Y., Yuen, A. C. Y., Chan, R. Y. K., & Chan, S. W. (2012). A review of the cardiovascular benefits and antioxidant properties of allicin. Phytotherapy Research. Wood R. (1999) The New Whole Foods Encyclopedia. Penguin (Non-classics). Aissaoui A, Zizi S, Israili ZH, Lyoussi B. (2011) Hypoglycemic and hypolipidemic effects of Coriandrum sativum L. in Meriones shawi rats. J Ethnopharmacol. 1; 137(1):652-61. Kelm MA, Nair MG, Strasburg GM, Dewitt DL. (2000) Antioxidant and cyclooxygenase inhibitory phenolic compounds from Ocimum sanctum Linn. Phytomedicine; 7(1):7-13. Yazdanparast, R., & Alavi, M. (2001). Antihyperlipidaemic and antihypercholesterolaemic effects of Anethum graveolens leaves after the removal of furocoumarins. Cytobios, 105(410), 185. Panda, S. (2008). 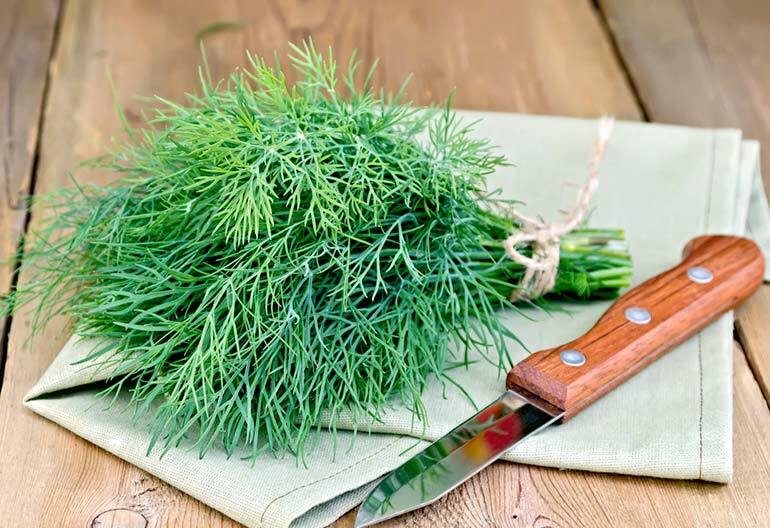 The effect of Anethum graveolens L. (dill) on corticosteroid induced diabetes mellitus: involvement of thyroid hormones. Phytotherapy Research, 22(12), 1695-1697. Jetté L, Harvey L, Eugeni K, Levens N. (2009) 4-Hydroxyisoleucine: a plant-derived treatment for metabolic syndrome. Current Opinion in Investigational Drugs; 10(4):353-8. Srichamroen A, Field CJ, Thomson AB, Basu TK. (2008) The Modifying Effects of Galactomannan from Canadian-Grown Fenugreek (Trigonella foenum-graecum L.) on the Glycemic and Lipidemic Status in Rats. Journal of Clinical Biochemistry and Nutrition; 43(3):167-74. Kaviarasan S, Sundarapandiyan R, Anuradha CV. (2008) Protective action of fenugreek (Trigonella foenum graecum) seed polyphenols against alcohol-induced protein and lipid damage in rat liver. Cell Biology and Toxicology; 24(5):391-400. Yusra Al Dhaheri, Samir Attoub, Kholoud Arafat, Synan AbuQamar, Jean Viallet, Alaaeldin Saleh, Hala Al Agha, Ali Eid, Rabah Iratni. (2013) Anti-Metastatic and Anti-Tumor Growth Effects of Origanum majorana on Highly Metastatic Human Breast Cancer Cells: Inhibition of NFκB Signaling and Reduction of Nitric Oxide Production. PLoS ONE 8(7): e68808. Gertsch, J., Leonti, M., Raduner, S., Racz, I., Chen, J. Z., Xie, X. Q., … & Zimmer, A. (2008). Beta-caryophyllene is a dietary cannabinoid. Proceedings of the National Academy of Sciences, 105(26), 9099-9104. Harach, T., Aprikian, O., Monnard, I., Moulin, J., Membrez, M., Béolor, J. C., … & Darimont, C. (2010). Rosemary (Rosmarinus officinalis L.) leaf extract limits weight gain and liver steatosis in mice fed a high-fat diet. Planta medica, 76(06), 566-571. Tu, Z., Moss-Pierce, T., Ford, P., & Jiang, T. A. (2013). Rosemary (Rosmarinus officinalis L.) Extract Regulates Glucose and Lipid Metabolism by Activating AMPK and PPAR Pathways in HepG2 Cells. Journal of agricultural and food chemistry, 61(11), 2803-2810. Goldberg, B. (2013). Alternative medicine: the definitive guide. L. Trivieri, & J. W. Anderson (Eds.). Random House Digital, Inc.
Kordali, S., Kotan, R., Mavi, A., Cakir, A., Ala, A., & Yildirim, A. (2005). Determination of the chemical composition and antioxidant activity of the essential oil of Artemisia dracunculus and of the antifungal and antibacterial activities of Turkish Artemisia absinthium, A. dracunculus, Artemisia santonicum, and Artemisia spicigera essential oils. Journal of agricultural and food chemistry, 53(24), 9452-9458. How to make a salad taste awesome!